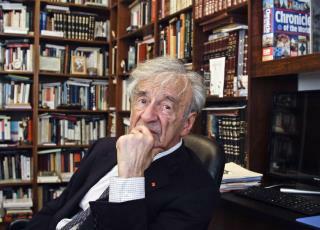 (Newser) – Nobel laureate and Holocaust survivor Elie Wiesel has died at the age of 87, the AP reports. The death of one of the world's foremost witnesses and humanitarians was announced Saturday. Wiesel summed up his mission in 1986 when accepting the Nobel Peace Prize: "Whenever and wherever human beings endure suffering and humiliation, take sides. Neutrality helps the oppressor, never the victim. Silence encourages the tormentor, never the tormented." For more than a half-century, he voiced his passionate beliefs to world leaders, celebrities, and general audiences in the name of victims of violence and oppression. He wrote more than 40 books, but his most influential by far was Night, a classic ranked with Anne Frank's diary as standard reading about the Holocaust.